In accordance with its standard-setting role, IPDC has developed a comprehensive set of Media Development Indicators (MDIs) aimed at enabling the assessment of media landscapes at national level. These indicators, that cover all aspects of media development, are currently being applied in various countries worldwide to identify their specific needs in view of guiding the formulation of media-related policies and improving the targeting of media development efforts. The Media Development Indicators were developed through a broad international consultation launched by the IPDC Intergovernmental Council at its 25th session in 2006. A detailed mapping of the main existing initiatives to define indicators of media development was carried out, in order to analyze their respective methodologies as well as their value and relevance to the priorities of the IPDC. On the basis of this mapping, a set of indicators aimed at covering all aspects of media development was elaborated and finalized after a two-year consultation process. 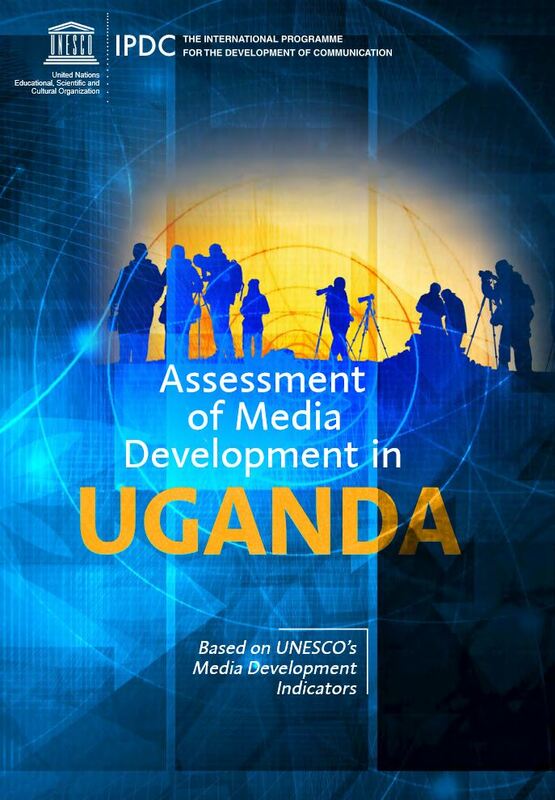 The indicators were endorsed by the Council at its subsequent session in 2008 as an “important diagnostic tool for all stakeholders to assess media development in a given country and to thereby determine the areas in which assistance is most needed”. The Council adopted a Decision inviting the IPDC Bureau and other stakeholders working in the area of media development to take the Media Development Indicators into account when determining, in tandem with national authorities, communication development strategies within the overall context of national development. Since 2008, the MDIs have been widely acknowledged by major actors in the media development field, including UNDP, the World Bank, the Council of Europe (see Resolution 1636, 2008), the International Federation of Journalists, International Media Support, the Media Foundation for West Africa and the Doha Centre for Media Freedom. Taken as a whole, they provide an aspirational picture of the media ecology to be constructed in order to ensure freedom of expression, pluralism and diversity of the media. By indicator, one should understand a quantitative or qualitative factor or variable, measured over time, that provides a simple and reliable basis for assessing achievements, change or performance in a country’s media landscape. For each indicator, the MDI framework suggests various means of verification as well as potential data sources. This paper defines indicators of media development in line with the priority areas of the International Programme for the Development of Communication (IPDC): promotion of freedom of expression and media pluralism; development of community media; and human resource development (capacity building of media professionals and institutional capacity building). The paper suggests five major categories of indicators that can be used to analyse the media development of a country. Each category is broken down into a number of component issues which in turn contain a series of broad indicators. 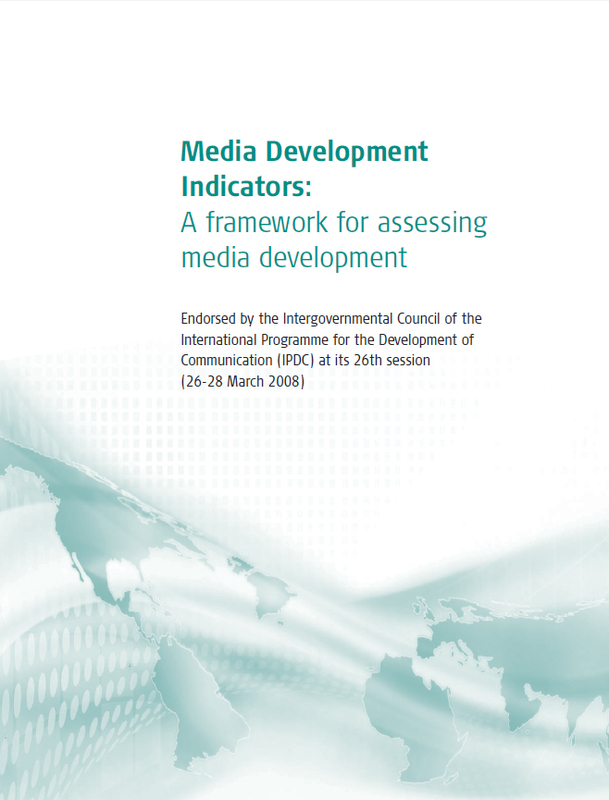 These indicators are an analytic tool designed to help stakeholders assess the state of the media and measure the impact of media development programmes. They are diagnostic tools, not commandments – conceptualised with the purpose of assisting media development programmes, not imposing conditionality. This document will be tested and adjusted on the ground by its ultimate intended users – the journalists and news organizations, and citizens’ groups working to strengthen media on the local level. In order to fully operationalize the Media Development Indicators framework, a new set of standardized media statistics, which uses the MDIs as a starting point, has been developed in collaboration with the UNESCO Institute for Statistics (UIS). The new survey was piloted in 28 countries around the world throughout 2011 and further refined following this experience (Click here to view the analytical report prepared by UIS on the basis of this first pilot survey.). A second pilot exercise involving some 60 countries was organized in 2012. 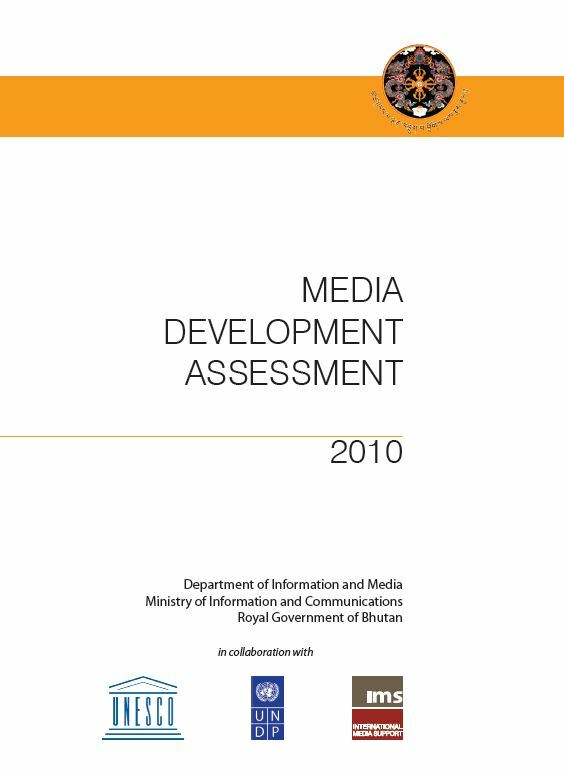 Completed in 2010, the Bhutan Media Development Assessment Report provides a detailed and informed assessment of the Bhutanese media environment with an aim to serve as a framework for evidenced-based intervention. Bhutanese media are active participants in the process of change, creating new realities and sustaining traditional values. The Assessment follows the introduction of democratic reforms in Bhutan and the rapid increase of media organizations resulting from the liberalization of media policy. It looks at areas of media development, defining issues and challenges that the media industry faces in Bhutan. Moreover, it gives an overview of media consumption in Bhutan, and prioritizes areas of interventions required. Drafted in partnership with the UNDP and International Media Support, the assessment provides analysis of the media and communications environment in Bhutan against internationally accepted standards and principles. The assessment found that a liberalized media licensing policy has been effective in encouraging media diversity and de­velopment and that constitutional guarantees exist which give Bhutanese citizens and the media considerable freedom of expression and speech. However, the study revealed a need to encourage a culture of public discussion by enhancing access to media, especially in rural areas and un­reached populations. The findings also revealed a need for stronger right to information laws to be put in place in order to cre­ate a more transparent democratic system. 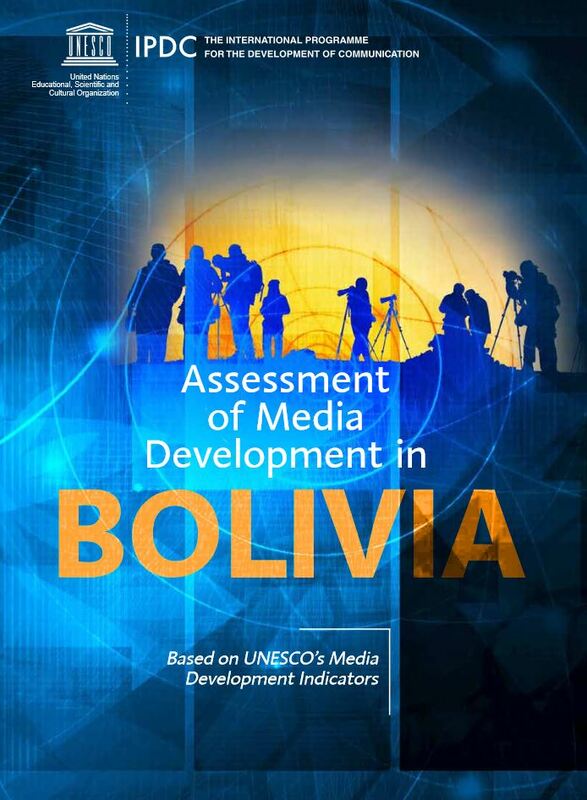 The UNESCO’s Media Development Indicators study (MDI) in Bolivia made a comprehensive media diagnosis as a democratic discourse platform, current laws related to Communication and Journalism, and the Constitutional warranties to freedom of expression for citizen and journalists. The study's findings portray a complete panorama of the information and journalism media in Bolivia, by comparing against international freedom of expression standards, and add value to research, by updating and enhancing knowledge about the antecedents, progress and current status of the MDIs in Bolivia, and by providing conclusions in five categories touching on fundamental aspects of the media environment to exercise the right to freedom of opinion and expression. The study tracks the consultations with interested parties in media management, content creation and access generation, editorial control and censorship, among other fundamental issues, fostering plurality from various perspectives to prepare recommendations based on empirical data, geared toward reducing the gaps detected in media development and promote the existence of free, independent media. In the course of its accession to the EU, Croatia had to meet EU media and information society requirements. This led to significant development of the Croatian media system. However, there remained a number of areas that could be further enhanced and problems to be identified in the media policy framework and its implementation. 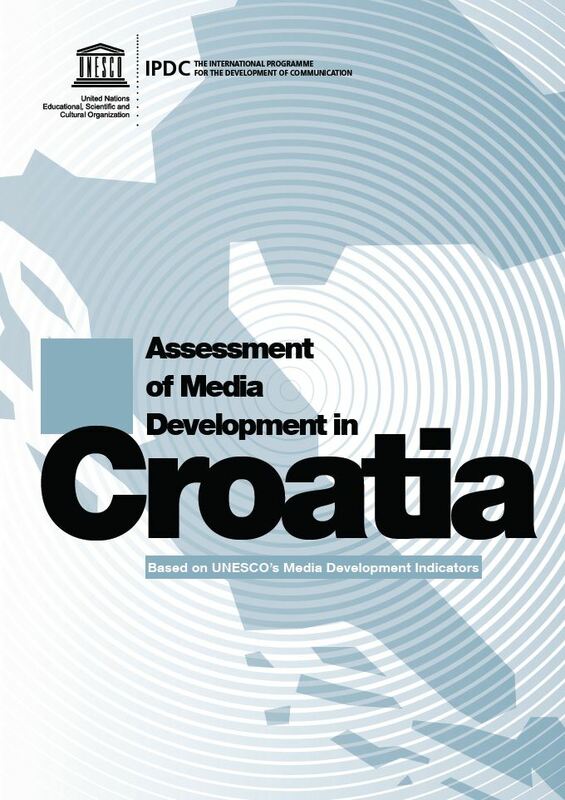 The Media Development Indicators (MDIs) Assessment was undertaken with the goal of further improvement and analysis of media development in Croatia. The analysis of the status of pluralism, diversity and freedom in the Croatian media system, using the UNESCO MDIs as a methodological template, was completed in 2011 by a team of researchers at the Centre for Media and Communication Research, Faculty of Political Science, University of Zagreb. This Report describes the capacity of the Croatian media to work in a democratic regulatory environment and in a free but concentrated market. It reveals that the infrastructure available in Croatia is technologically developed and increasingly digitalized. However, it also highlights problems that remain with regard to the democratic contribution of the media and transparency and accessibility of data regarding the media system, the precarious position of journalists, as well as still existing issues of independence of the media from economic or political power hubs. Curaçao is the first country in the Caribbean to utilize UNESCO’s Media Development Indicators (MDIs) to assess its media landscape. Curaçao’s media landscape is vibrant one, with no less than 28 licensed radio stations, eight newspapers and three television stations for the island's population of just over 150,000 inhabitants. The publication of the report comes six years after the dissolution of the Netherlands Antilles on 10 October 2010 (‘10-10-10’). Since then, the former ‘Island territory’ of Curaçao enjoys the status of an autonomous country within the Kingdom of the Netherlands. By becoming a new country, Curaçao was provided with the opportunity to conceive a new constitution and embarked in a series of legal reforms. It is expected that this report, which is the result of a year-long study, will help guide legal reform and the definition of policies affecting the media sector in view of enhancing the media’s contribution to achieving the Sustainable Development Goals in Curaçao. Curaçao is the first country in the Caribbean to utilize UNESCO’s Media Development Indicators (MDIs) to assess its media landscape. Curaçao’s media landscape is vibrant one, with no less than 28 licensed radio stations, eight newspapers and three television stations for the island's population of just over 150,000 inhabitants. The publication of the report comes six years after the dissolution of the Netherlands Antilles on 10 October 2010 (‘10-10-10’). Since then, the former ‘Island territory’ of Curaçao enjoys the status of an autonomous country within the Kingdom of the Netherlands. By becoming a new country, Curaçao was provided with the opportunity to conceive a new constitution and embarked in a series of legal reforms. It is expected that this report, which is the result of a year-long study, will help guide legal reform and the definition of policies affecting the media sector in view of enhancing the media’s contribution to achieving the Sustainable Development Goals in Curaçao. The MDI assessment process in Curaçao was nationally-driven and, as little data on media development was available, it involved wide-ranging consultations with key media stakeholders in addition to desk-based research. ‎The consultations included 28 in-depth interviews throughout Curaçao, four focus groups with media workers and members of the public, and three opinion polls respectively targeting 54 media workers, 11 media managers and a representative sample of 708 inhabitants of Curaçao. Careful attention was given to including perspectives from all areas and to ensuring a gender-sensitive approach. The description of the publication is available in Spanish only. 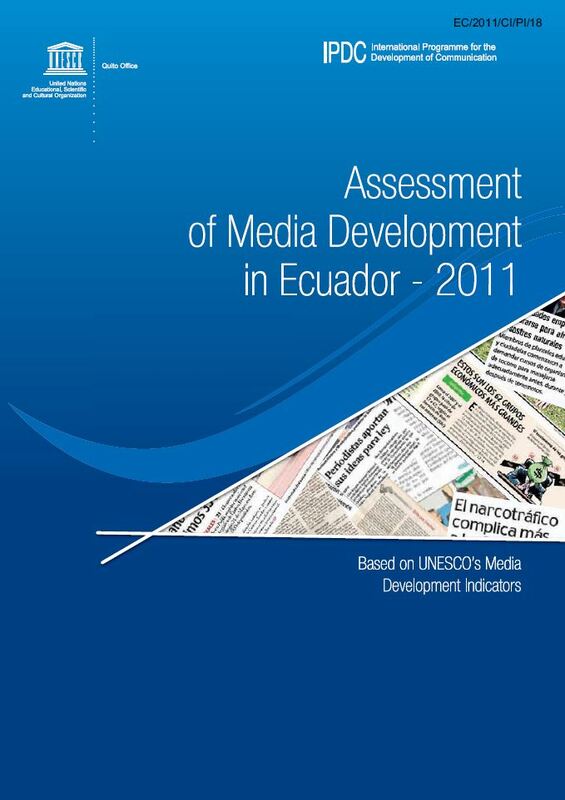 Ecuador was the first country in Latin America to apply UNESCO’s Media Development Indicators (MDIs). In 2011, the year the report was completed, there were referendums underway in Ecuador with questions directly focusing on media. The study presents a comprehensive assessment of the state of media development in Ecuador and also a series of recommendations to be taken into account by relevant sectors to improve current conditions and construct a more independent, plural and participatory media platform. The International Centre of Higher Studies in Communication for Latin America (CIESPAL) worked with UNESCO on the application of MDIs in Ecuador. The Report was enriched with contributions from specialists in international standards and from a consultative group comprised of representatives from the country’s different communication sectors. The Assessment shows that freedom of expression in Ecuador is protected by the Constitution and legislation. However, prerequisites established in the Constitution imply that this right may be undermined. While there are laws to prevent concentration of media ownership, the media does not adequately reflect the diversity of society. The public and private media have modern technical facilities to gather, produce and distribute news. The community sector, by contrast, lacks the infrastructure for optimal use of ICTs. 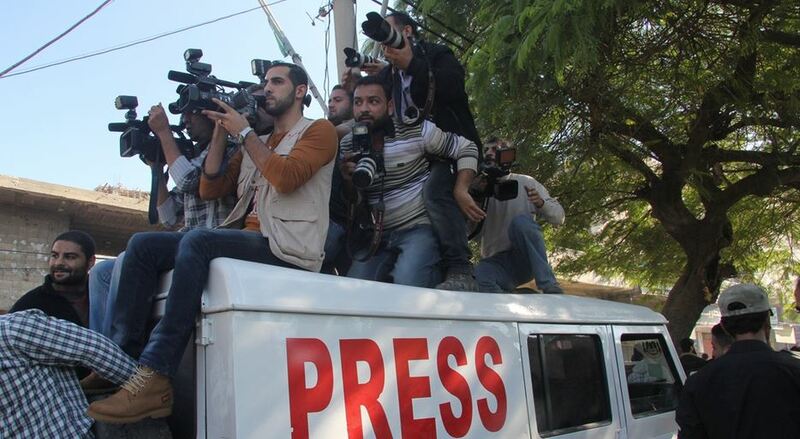 In 2013 an in-depth Assessment of Media Development was completed in Egypt. Following the demonstrations of 2011 and the downfall of the Mubarak regime there was a pressing need for an assessment of the media in Egypt and immediate calls by civil society for significant reform of the legal framework governing the media. 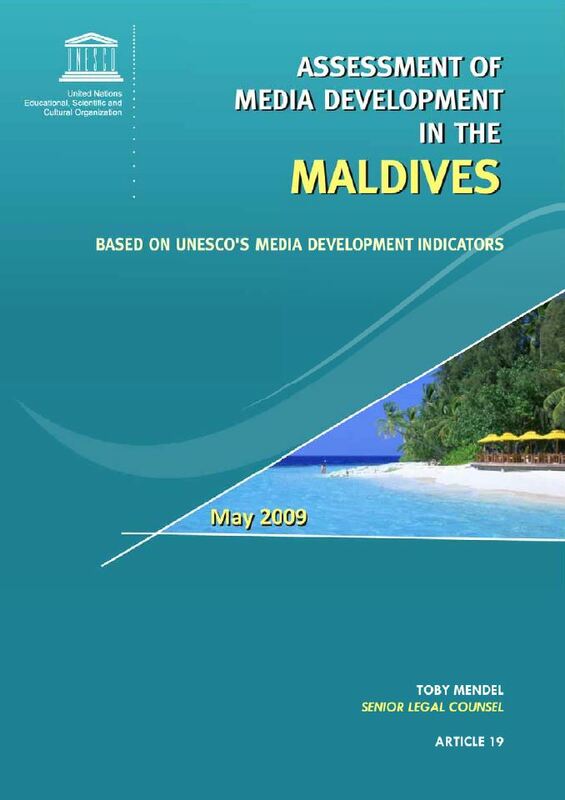 The UNESCO Media Development Indicators (MDIs) Report was completed within this context. The Mubarak period was characterised by severe repression of democratic rights. Freedom of expression was among those rights that were most restricted during Mubarak’s rule. 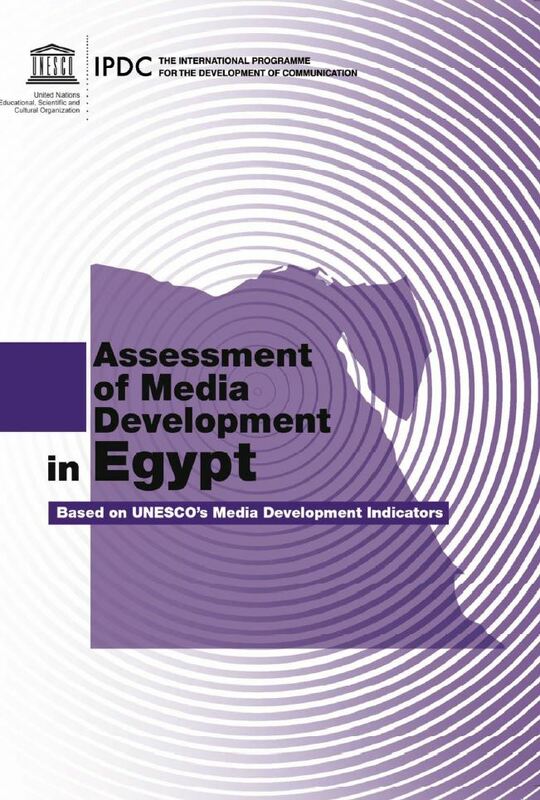 The Egypt MDIs Study provides a comprehensive review of media development needs based on a data gathering process with involvement of local experts and stakeholders. The assessment of Egypt relative to the indicators takes into account the special challenges facing the country, and in particular the context of revolutionary change that it is grappling with. The Report was developed on behalf of UNESCO by a group of international and Egyptian media researchers. It provides local stakeholders including, civil society, state institutions and relevant professional communities with a detailed mapping of key media development needs in the country, based on the internationally accepted and tested methodology. The media landscape of Gabon has been liberalized since 1991. Nevertheless, it has evolved slowly caused by a media monopoly held since the 1980s. Today however the media is growing in its plurality and diversity. In 2010, the Gabonese authorities had expressed a desire to revise the current laws on media. This Report uses the Media Development Indicators (MDIs) to analyse the different aspects of the media environment in Gabon and make recommendations to aid the government improve the media laws to foster media development in a plural and diverse manner. 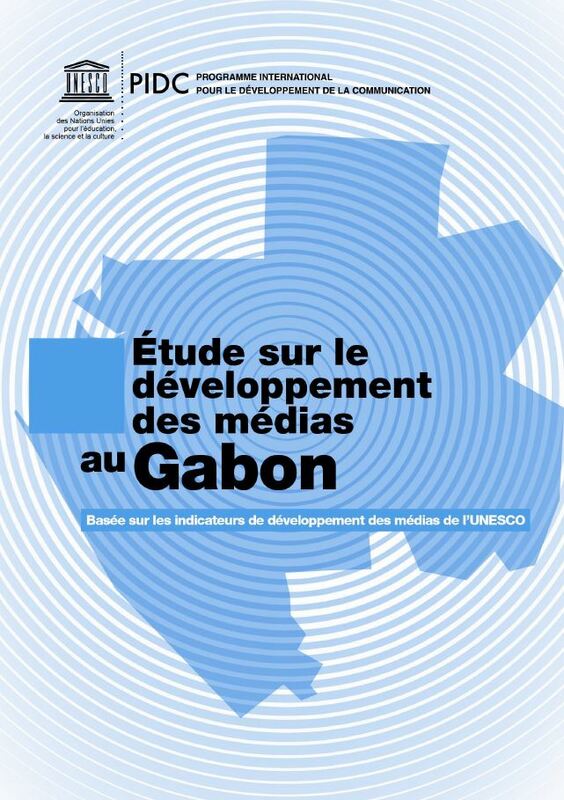 Initiated by UNESCO in partnership with UNDP, the assessment of media development in Gabon was published in 2013. The Gabon assessment was conducted by a team of 10 national experts in association with two international experts and UNESCO. The findings of the Report show that there is a need for a regulatory framework for media development. It also highlights a need for a constitutional guarantee for the right to information and for that information to be made readily available to the public and journalists. Recommendations were made for a better system to identify cases of restriction and violations of freedom of expression and information, and for the removal of restrictions that inhibit the protection of sources. Further recommendations were to promote diversity of media, encourage the implementation of media in rural zones and put in place tax systems which give preference or advantages that will aid the development of media. 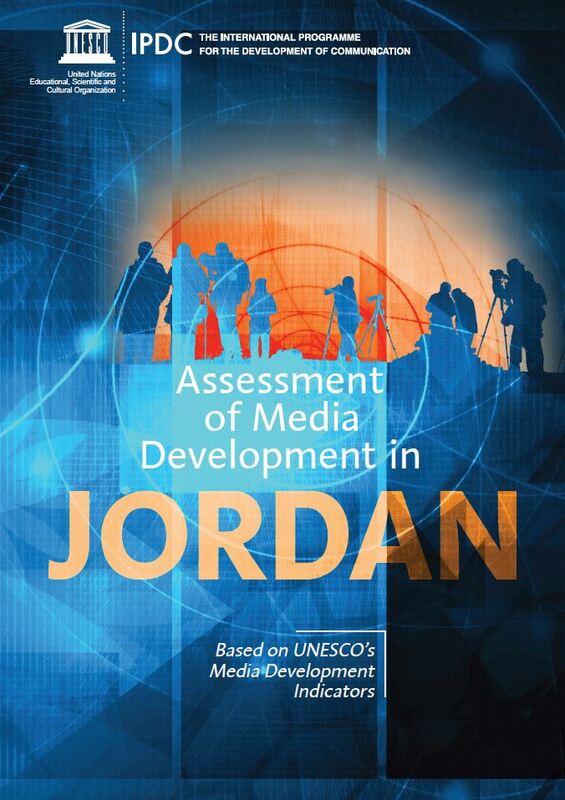 The report on Media Development in Jordan was carried out in 2015 as part of the Support to Media in Jordan Project, funded by the European Union (EU). The MDI assessment in Jordan was complemented by a comparative analysis of better public service media (PSM) practices in selected European countries and the contemporary practice in Jordan. Together, the MDI assessment and the comparative PSM analysis are intended to form the basis for a review of the government’s Action Plan for the Media Strategy that could lead to the development of a revised Action Plan to be agreed upon by the relevant national stakeholders. 10 focus group discussions on specific thematic areas such as the legal and policy framework, refugees, gender and community media; Eight UNESCO-facilitated national consultations in Ajloun, Jordan Valley, Karak, Maan, Madaba, Mafraq, Tafileh and Zarqa; Four thematic workshops and a thematic roundtable focusing on public service broadcasting, training and education, self-regulation, local radio and Media and Information Literacy; Over 30 individual interviews; Input and support from a Jordanian Advisory Board of experts in media development. In addition to the consultations, the study involved an extensive literature and legal review. As in any open society, the Libyan media sector has the potential to bolster the country’s democratic transition by providing reliable, unbiased and timely information to the population, and educating the Libyan population about the broader political process. International donors have an opportunity to support the development of the Libyan media sector by facilitating training and promoting professional journalistic practices and a fair regulatory environment that will encourage the development of professional journalism. In the three years since the fall of the former regime, many international actors have worked to develop the Libyan media sector. To track these developments, UNESCO conducted a partial baseline assessment of the current state of media development in the country based on the Media Development Indicators (MDIs). UNESCO and the national counterparts decided to limit the focus of the MDI assessment to the two areas most relevant to the challenges existing in the media sector at the time the assessment was being undertaken in early 2014, namely Safety of Journalists and Professional Capacity Building and Supporting Institutions that underpin Freedom of Expression, Pluralism and Diversity. In doing so, this report provides the essential background to understand why crimes against media professionals are committed with impunity, and perhaps more worryingly, where the media itself plays an active role in the conflict. This study presents an assessment of the development of the Madagascar media in the context of a return to the democratic functioning of the institutions following the political crisis of 2009-2013, which resulted in a high political instability and an economic decline. Based on UNESCO’s Media Development Indicators (MDIs), this assessment guides the country in the process of strengthening the governance of key democratic institutions and contributes to the development of free, independent and pluralistic media. The study provides a detailed analysis of the media landscape in Madagascar. It examines the legal, regulatory and economic frameworks in which Malagasy media operate, their democratic potential, education and training initiatives, and infrastructure that has an impact on media development in the country. Although the analysis is based on international standards and best practices, the recommendations are adapted to Madagascar's particularities. The analysis was carried out in 2014 in an environment that has evolved in the meantime, but could serve as a basis for media development initiatives in the country. It is expected that this analysis will contribute to the freedom, independence and plurality of the media in Madagascar, which will allow citizens to obtain information enabling them to make informed choices and participate actively in democratic processes. This MDI report developed in Mongolia, published in 2016 by UNESCO, is the first-ever comprehensive assessment of the media landscape in the country. It was launched by UNESCO at the request of the Globe International Center and carried out in collaboration with specialized NGOs such as the Press Institute, the Confederation of Mongolian Journalists and the Transparency Fund, within the context of ongoing discussions on media law reform in Mongolia. This report is the result of an assessment on the Mongolian media landscape undertaken in 2013-2014 to determine the level of media development in the country and to inform and provide recommendations for future developments in the media sector. 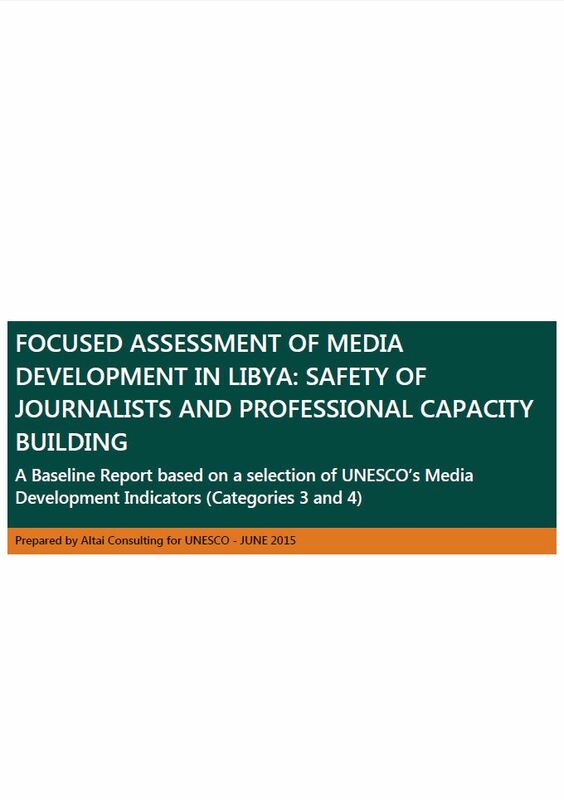 The assessment is based on the UNESCO/IPDC Media Development Indicators (MDIs), which are an internationally recognized analytical tool that make possible a detailed overview of national media landscapes and related media development priorities. This assessment places special emphasis on issues affecting freedom of expression and press freedom; how current state legislation impacts on the media and how it can be amended to provide more space for self-regulation within the media; legislation regarding defamation; restrictions on the daily activities of media outlets; transparency in media ownership; standards of journalism, professional training and research; and labour relations and working rights affecting journalists in their daily activities. It provides a comprehensive overview of the challenges facing Mongolia’s media as the sector grows substantially. The assessment was carried out by UNESCO, in partnership with a network of organizations, including the Globe International Center, the Press Institute, the Confederation of Mongolian Journalists, and the NGO Transparency Fund. Mozambique has experienced a dramatic growth of its community media sector and a general expansion of its media environment over the last 10 years. 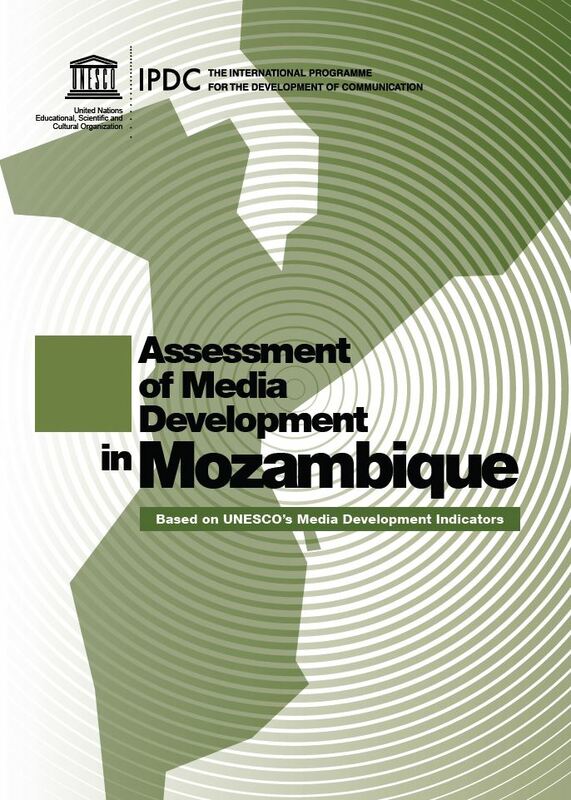 The Government of Mozambique requested UNESCO to carry out a study that would use the Media Development Indicators (MDIs) to assess its evolving national media landscape. The specific objective was to assess the existence or otherwise of a legal, political, institutional and infrastructural framework that favours press freedom, pluralism and diversity of the media in Mozambique and produce recommendations to the appropriate actors on the basis of the findings. UNESCO collaborated with the Mozambican Chapter of the Media Institute of Southern Africa (MISA-Mozambique) to organize the study. The research team based its work on an extensive literature review, with an emphasis on the main applicable legislation and policy and strategy documents for the media sector in Mozambique. Mozambique has a diverse media with a mix of state, public sector, private and community media, with the public and community radio broadcasting sectors having the most extensive coverage. However, there is a continuing legal deficit in certain aspects, such as the existence of laws that are in contradiction with the principles defined by the Constitution regarding media, and cases of infringements of the law that have been denounced by media organizations and civil society in general. Moreover, the economic fragility of the sector as a whole is obvious, particularly in the community sub-sector. The MDI report on media development in Myanmar, published in June 2016, is the result of a collaboration between the UNESCO Bangkok Office and press freedom NGO International Media Support (IMS). National ownership of the assessment process was ensured through the involvement of the department of journalism at the National Management College of Myanmar as well as through various multi-stakeholder consultations. Five years after the country embarked on a series of political, social, and economic reform processes, this report represents an objective, analytical stock-taking of how far Myanmar has progressed towards a more free, independent and pluralistic media. Key developments in the media sector include the adoption in 2014 of the Printing and Publishing Enterprise Law (PPEL), which officially abolished past prior censorship and allowed newspapers to become editorially independent from the state; the Broadcasting Law of 2015, which enables private, public and community media to flourish; and the establishment of the Myanmar News Media Council in October 2015. The MDI report on media development in Myanmar, published in June 2016, is the result of a collaboration between the UNESCO Bangkok Office and press freedom NGO International Media Support (IMS). National ownership of the assessment process was ensured through the involvement of the department of journalism at the National Management College of Myanmar as well as through various multi-stakeholder consultations. Five years after the country embarked on a series of political, social, and economic reform processes, this report represents an objective, analytical stock-taking of how far Myanmar has progressed towards a more free, independent and pluralistic media. Key developments in the media sector include the adoption in 2014 of the Printing and Publishing Enterprise Law (PPEL), which officially abolished past prior censorship and allowed newspapers to become editorially independent from the state; the Broadcasting Law of 2015, which enables private, public and community media to flourish; and the establishment of the Myanmar News Media Council in October 2015. The assessment was carried out over a period of 18 months and canvassed the multiple aspects of the media landscape in Myanmar, addressing the 50 indicators of the MDI framework. Data gathering methods included literature review, legal stock taking, a public opinion poll involving 1020 respondents, a total of 90 key informant interviews, and 48 focus groups discussions across five states and four regions. Each chapter of the report provides a set of recommendations on the way forward with a view to contributing to the ongoing reform of the media sector in Myanmar. Nepal’s media have developed tremendously over the past decades. 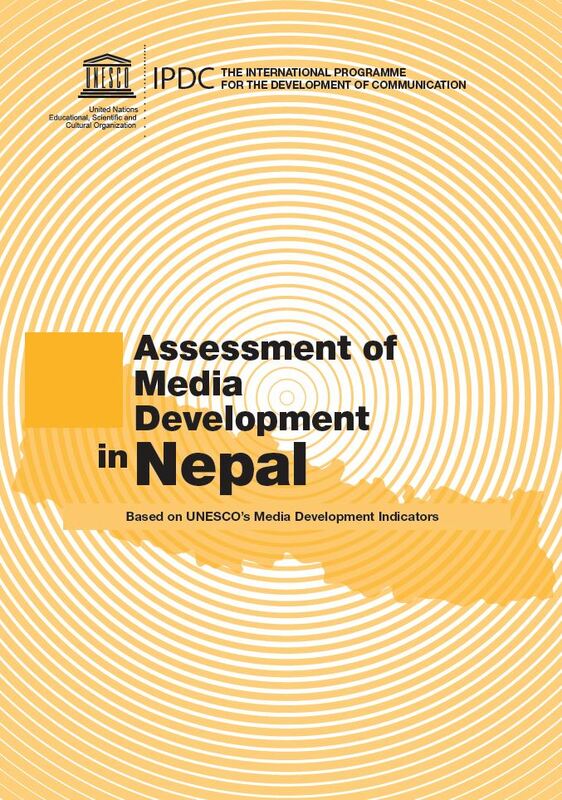 UNESCO’s pioneering base-line study “Assessment of Media Development in Nepal”, launched on 19 December 2013, provides comprehensive material to analyze the country’s media landscape. Applying the UNESCO’s Media Development Indicators, the Study contributes to present discussions on constitutional and legal reforms and media self-regulation mechanisms. It is intended to guide the efforts of all actors working for media development. It also provides a baseline for subsequent assessments of Nepal’s media landscape. The study was coordinated by a team of national experts and builds on analysis and suggestions made by representatives of government, media trade unions, professional associations and civil society. The wide-ranging Study deals with legal and policy frameworks relating to the media as a matter of both form and substance. It assesses the capacity of Nepal’s media regulation system to contribute to freedom of expression, pluralism and diversity of the media. It analyses the existing legal and policy frameworks and regulatory systems for broadcasting, and other legal provisions that may restrict the work of journalists. It discusses existing media laws and regulations in Nepal and their compliance with international standards. How media reflects the diversity of society is looked at and also the role of public service broadcasting. The Study further focuses on the availability of professional media training and academic courses available for media. The Report provides concrete recommendations for action the development of media in Nepal. 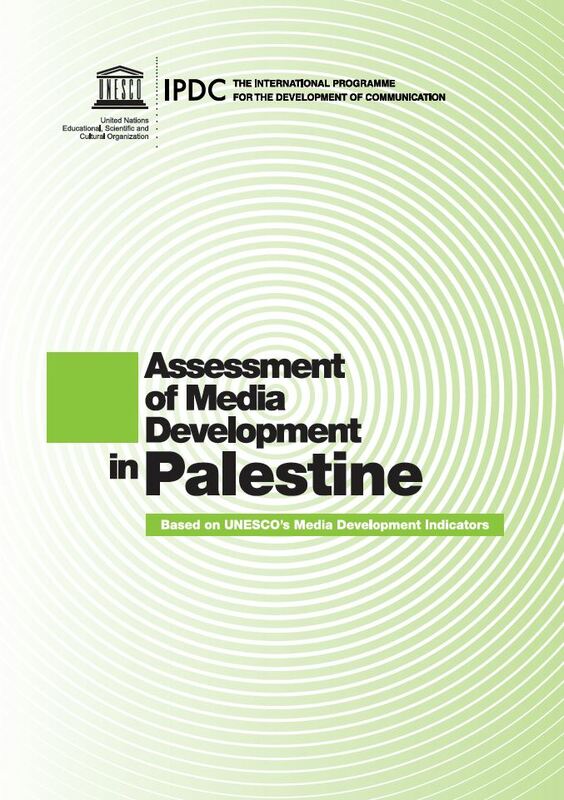 This report aims to inform and support the development of Palestine’s media sector through the conduct of a comprehensive assessment of the media environment, based on international legal standards and good practice. This project is part of a wider UNESCO initiative to assess the strengths and weaknesses of national media sectors across the globe using a common analytical framework endorsed by a UNESCO intergovernmental Council - the UNESCO/IPDC Media Development Indicators. Through this study, UNESCO has sought to engage national stakeholders in a process of constructive dialogue and critical reflection in order to identify key media development priorities. Such a platform allowed discussion of the most appropriate ways of addressing the priorities in line with international standards. UNESCO expects that this report will constitute a useful reference for all stakeholders and effectively contribute to the further development of Palestine’s media landscape. The Assessment of Media Development in South Sudan accompanies South Sudan in the process of democratic transition and contributes to the development of free, independent and pluralistic media. 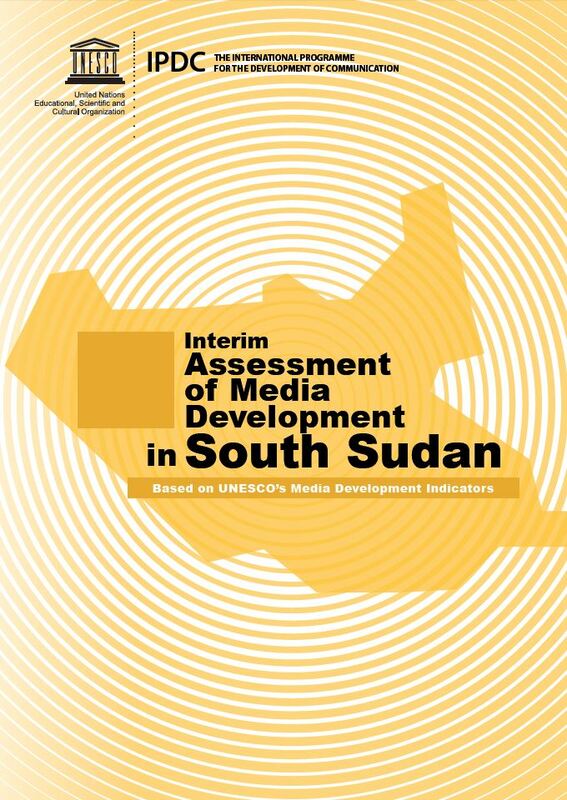 While this analysis is based on international standards and good practices, the recommendations are adapted to the particularities of South Sudan following a National Conference on the Preliminary Findings of the Assessment of Media Development in South Sudan organized on 29 October 2013. The assessment was undertaken between 2012 and 2014, and jointly funded by International Media Support (IMS), UNESCO through the International Programme for the Development of Communication (IPDC) and the Swedish International Development Cooperation Agency (Sida). It provides the first detailed analysis of the media landscape in South Sudan since its independence. It looks at the legal, regulatory and economic frameworks in which the media in the country operates, their democratic potential, education and training initiatives and the infrastructure that impacts media development in the country. The assessment was carried out in a volatile and fast-changing environment, but will serve as a baseline for media development initiatives in the country by the Media Sector Working Group (MSWG). The MSWG, of which UNESCO serves as Secretariat, coordinates the efforts of all media partners, both nationally and internationally, towards the planning and monitoring of media development activities in South Sudan in line with development goals. The working group advocates for the necessary human and financial resources to address the most pressing priorities facing the public, community and private media sectors. This study aims to assess and gain an in-depth understanding of the Swaziland media landscape using UNESCO MDIs. It offers recommendations that are intended to provide guidance to policy makers, lawmakers, the media, civil society organisations, universities and training institutions on how to strengthen a free, independent and pluralistic media in Swaziland in keeping with international standards and principles. More importantly, it is also intended to provide a reliable resource for other decision-makers, including donor institutions and development partners with a keen interest in addressing the identified priority areas outlined by the national stakeholders. Based on UNESCO's Media Development Indicators (MDIs) this Report assesses the overall state of media development in the Maldives. In 2008 the Maldives adopted a new Constitution. However, there is still much to be done with respect to media freedom in the Maldives. The MDIs Report takes into account the special situation of the country, particularly in terms of its size and consequent relative lack of capacity, and makes recommendations to assist the Maldives with their media development. The Maldives report was a rapid assessment written in regards to an urgent need for the assessment of media development at time when the country was in the process of adopting fundamental constitutional and judicial reforms. The report therefore constitutes a lighter application of the MDI methodology. The preparation of this assessment was based on interviews conducted during a mission to the Maldives in 2009 and supplemented by information provided by email, and a review of the available literature. In the late-2000s the Maldives began to relax media laws and to license private stations. In 2007, the government reported on the need to create a legal framework for the media and aimed to address this, among other things, in its 2008 Constitution. However, many remaining problems were highlighted in the 2009 MDI assessment and recommendations were made in regards to: media legislation being in line in with international standards, a need for independent regulators and the removal of undue restrictions on media content. Measures also need to be taken to ensure greater access to television and the internet for underprivileged people and a longer term ICT policy plan developed and implemented. Only gaining effective independence from Indonesia in 1999 and formally declaring its independence in 2002, Timor-Leste has had a turbulent recent history, including decades of struggle against Indonesian occupation. 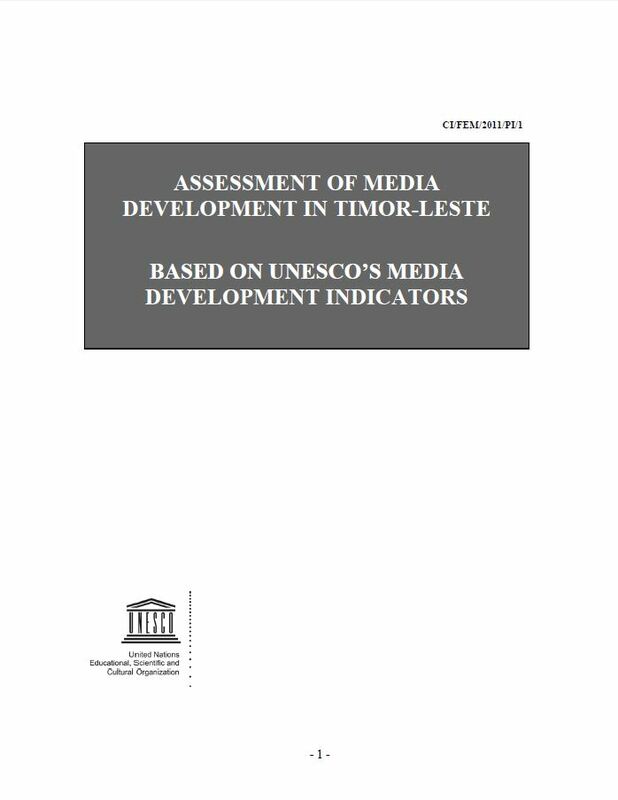 This Report assesses the overall state of media development in Timor-Leste in light of these difficulties. It takes into account the special challenges facing the country, including its relative poverty, small population, geographic isolation and the wider challenges associated with its recent emergence from colonial rule and foreign occupation. The Media Development Indicators (MDIs) Assessment in Timor-Leste was completed in 2011. Timor-Leste’s political instability and problems with its democratic elections post-independence led to difficulties creating a Constitution and legislation relating to media. The laws left over from the the Indonesian Civil Code were inapplicable to the current situation of the country. When a working government was formed in 2009, the new laws proposed were strongly criticised by both local civil society organisations and members of the international community. The Report found the adoption of legislation in accordance with international standards a priority. Further recommendations were for the establishment of an independent body to ensure the regulation of broadcasting licensing in the public interest through a transparent process involving civil society. A pressing need to increase the accessibility of quality access to the Internet and other communications technologies was also revealed. It is widely recognized that the media have a central role to play in the transition to democracy and the strengthening of political rights and civil liberties. 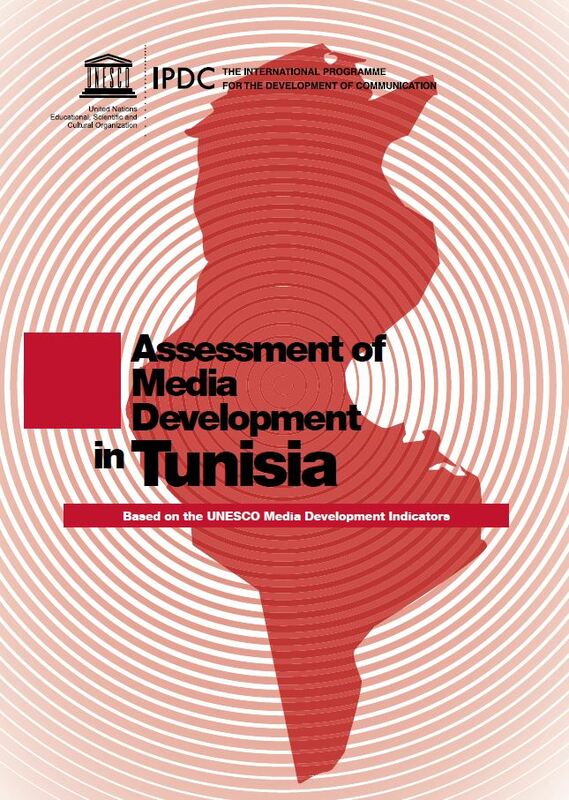 This study, based on the Media Development Indicators (MDIs) of UNESCO, examines progress that has been made in media development in Tunisia since the Arab Spring of 2011. The MDIs provide a comprehensive framework for analyzing strengths and weaknesses of the current media environment in Tunisia, drawing on a proven methodology that is based on international standards and good practice. The purpose of this study is to support the democratic transition in Tunisia and to contribute to the development of free, independent and pluralist media. Coordinated by a team composed of two national experts and one international expert, it builds on the work of the National Authority for Reform of Information and Communication (INRIC), of the government, of media trade unions and professional associations, of civil society and of international organizations, and has been implemented in consultation with the principal national stakeholders. This study of the media sector forms part of an enhanced collaboration between UNESCO and Tunisia to support transformation of the media and, in turn, the democratic transition in Tunisia. The Tunisia Report made recommendations, including that the government should ensure extensive public consultation before the adoption or modification of any law relating to freedom of expression or the media. In addition, the new Constitution should include a specific and detailed chapter on fundamental human rights consistent with the international treaties and conventions ratified by Tunisia. Measures to prevent concentration within and between different media sectors should be strengthened and transparency of ownership should be ensured, and the system for regulation of the broadcasting landscape should have as its principal objective the promotion of a diverse mix of public, private and community media. The study, carried out by the Department of Journalism and Communication, Makerere University, Uganda, offers a comprehensive assessment of the media landscape in Uganda and recommends possible steps to further develop a free, independent and pluralistic media landscape in line with international standards. The recommendations presented in the study are expected to not only contribute to the achievement of the Uganda Second National Development plan (NDP11) 2015/16 – 2019/20 (NDPII), which carries a vision of “A Transformed Ugandan Society from a Peasant to a Modern and Prosperous Country within 30 years”, but also to the media sector once the recommendations are implemented..
UNESCO has been supporting the media sector in Uganda, by strengthening the capacity of Uganda Community Media Network as a platform for democratic discourse, through which activities that empower local radios with ICTs have been sustained with the funding from the Government of Sweden. It is UNESCO’s hope that the study will contribute to achieving Uganda’s Vision 2040 blue print since it offers reliable data on Uganda’s media landscape. Assessments are ongoing in Bosnia and Herzegovina, Brazil, Ghana, Guyana, Haiti, Jamaica, Liberia, Malawi, Togo and Uruguay, as well as a regional project in South-East Europe. In most cases, UNESCO has partnered with a credible independent local research institution or media development organization, in charge of coordinating the study. Emphasis is placed on conducting multi-stakeholder consultations involving both private and public actors. These assessments result in the formulation of a series of evidence-based recommendations aimed at helping policy makers and media development actors to address identified gaps and foster enabling environments for free, independent and pluralistic media. Other organizations have also used the MDI framework to carry out assessments at their own initiative, such as in Benin (project carried out by Media Foundation for West Africa and DANIDA). An assessment of the media environment in Sri Lanka using the MDI framework has also been published by UNESCO partner, International Media Support. UNESCO has published a practical guidebook, available in English, French and Arabic, to assist researchers in applying the Media Development Indicators, based on the lessons learnt from the first series of assessments. The Media Development Indicators are also being used in the definition of a UN common approach to media development and good governance at country level. Finally, the IPDC Bureau has revised the format for the submission of projects requesting submitters to explain the links between MDIs and the development objectives of their proposals.